During a presentation at the Chicago Midwinter many years ago, Dr. Robert Stein of Boston, made a comment I have never forgotten. He stated, “When we dentists cut a preparation, the first thing we do is make a mistake, and then spend significant time correcting it!” I have often thought of that statement as I observed the procedures and use of products required for most dental laboratory procedures. Several decades ago, we started our work on a die that may have contained air bubbles, inadequate remaining tooth structure or improper configuration. Hence, the development by Dental Ventures of America of ZAPIT! At the same time, the ‘separators’ available, were actually not separators, but they were lubricants that distorted wax patterns, and therefore the final castings. Such was the generation of the development of the first, actual crown and bridge separator developed and introduced by DVA. “Hotstikz,” eliminated the aggravation of requiring denture labs to use sticky wax during the articulation of models. The introduction of zirconia required the need for a new standard of veneering polish; therefore, DVA developed “Zircon-Brite.” It has totally raised the bar in the performance of polishing products. Such has been the history of Dental Ventures of America – a company that has a well established history of introducing new products to the dental laboratory market that do NOT require “corrections’ with use; they actually perform. Such is certainly the case with DVA’s “CreamPress” pressing investment. While so many pressing investments are available, it seemed as though each one presented a differing challenge such that they required extra attention along with their use. Therefore, DVA saw another market opportunity, which was the genesis for the introduction of this new, extremely well-received product. Among other things, “CreamPress” provides an incredibly clean, reaction-free, pressed object, which fits with an outstanding accuracy. And, if divesting takes longer than desired, the ease of the divesting of “CreamPress” further increases one’s appreciation of the benefits offered by this very unique product. Given the very expressive comments of enthusiasm expressed by those using this product, DVA has managed to re-enforce its reputation of creating a higher level of product performance – “CreamPress” does what it was designed to do! It performs without having to make any “adjustments.” It improves both production efficiency and accuracy! It’s “fiddle-free;” just use it! Samples are available, so it might be advantageous to request them and see for yourself what is causing such positive reactions of appreciation by its users. 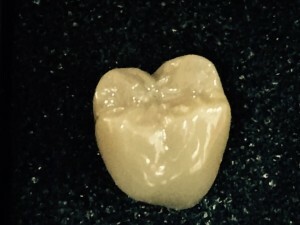 In her article, published in the 2013/2014 issue of Dentistry Today, entitled, “Focus on: Monolithic Crowns,” Dr. Rella Christensen, PhD, who leads TRAC Research Laboratory, which is devoted to clinical research in oral microbiology and dental restorative concepts, offers an insightful summarizing overview of the ongoing impact of monolithic restorations. In the article, Dr. Christensen states that “monolithic crowns, which are made of one, uniform material, are taking over in the U.S. Today, major dental laboratories are reporting orders for lithium disilicate and zirconia restorations higher than for PFM’s. The article asks the question, “Have any clinical cautions been noted?” Which generated the following response: “It is apparent that the glazes used on both materials will not be long lasting.” Interestingly, it was reported that as the glaze deteriorates, it becomes rough and imparts increasingly more abrasion to opposing dentition. Click on the link below to discover DVA’s “Zircon-Brite,” a polish that has been selected among the Top Dental Products for three successive years. Zircon-Brite provides a very efficient and effective manner for polishing Lithium Disilicate and Zirconia restorations, in less than a minute polishing time. In the first segment of my telling of the history of the founding of Dental Ventures of America, Inc., I mentioned how “happenstance” can impact one’s future. Such an occurrence was crucial in Jerry’s having become involved in dentistry. Upon graduation from high school in Fresno, California, Jerry wanted to be the first individual in his family to attend college. However, finding himself far short of having the financial support system to have that happen, he decided to forego his wish to further his education at that time, and instead opted to fulfill his military obligation by joining the U.S. Navy. During his enlistment procedures, he was told he was qualified to go to any technical school he might request, and asked which area of training he would like to pursue. Having no actual idea, but having heard many stories from his three Irish-American uncles, who had all served in the Pacific campaigns during WWII. Jerry didn’t relish going to sea. With this factor in play, the young 17-year old merely asked his experienced enlistment officer which guys he didn’t care for. (as in, “Were jealous of?”) “Dental Technicians,” the officer replied, “they have it made! They always get to sleep on large beds, get to wear civilian clothes all the time, never have to stand watches during the night, get cars on the base, and seldom have to go to sea!” Need we guess which Navy technical school Jerry informed the officer he wanted to attend? Not only did the future Founder of Dental Ventures of America become a Dental Technician, he also went on to a second school to become a Navy Prosthetic Technician. There he learned that the enlistment officer was indeed correct! Following his military service, Jerry trained himself to fabricate orthodontic appliances and opened a small lab in Covina, California, to support his university studies for the next eight years. Interesting though, that while he had been in the business world, Jerry never prepared himself for that area of activity; during all of those years of study, he never enrolled in one business course! One day, Jerry took it upon himself to pay a visit to the largest manufacturer of orthodontic products to pick up an order he had placed with them. While he was there, thought he, why not take it upon himself to share his thoughts about the company’s lack of marketing their “fine products!” After sharing his words of inexperienced wisdom, regarding Unitek’s (now part of 3M) “obvious failures” at marketing, etc.. A week or so later, Unitek called him and offered him a position to improve things! So began the future Founder’s commercial dental career. Though he knew nothing about, had no experience, and no educational background regarding the mission to which he had been invited; namely, “Get Unitek, the largest manufacturers of orthodontic products (at the time) into the dental laboratory business!” So began the commercial experience of my husband! More “Happenstance!” A scary position; but a great opportunity for growth and success! Dentistry’s most recognized and respected third-party product evaluation group, has reported in their November 2014 issue of “Clinicians Report” the best products and techniques for polishing acrylic appliances. Acrylic samples where polished to a final, high value finish comparing seven different acrylic polishing products. The surface roughness of all seven of the samples were then measured utilizing an optical profilometer and scanning electron micro-graphs at 2000X magnification. Both of these excellent, very unique polishing products are available either by calling DVA at 951-260-0606, or its Toll Free Number at 800.228.6696. Acryl-Marvel in either form may also be ordered directly from DVA’s website at dentalventures.com. A 10-gram “Testing Sample” will be included to verify the product’s effectiveness in your laboratory, along with a new polishing buff with each order. Order today, and begin to go from “Grind to Shine” in one, easy step, while also obtaining, a faster, cleaner and, according to the comparative study, an extremely smooth, polished surface. As we all know, the smoother the surface the more resistance to plaque build-up and staining of the denture. We might suggest a visit to the following link, http://vitals.nbcnews.com/_news/2012/04/05/10988431-dirty-dentures-dangerous-mrsa-may-be-lurking-dentists-say might give rise to an increased consideration for this “denture smoothness” factor. Special Offer for DVA’s Acryl-Marvel Cream, Order one 80gr jar of Acryl-Marvel for a 50% discount and receive a 10gr trial – a $24.50 value for $12.25. Use the trial jar, if not satisfied, return the 80 gram jar in resalable condition for a complete refund. Offer valid thru January 31st, 2015. Ever wonder how dental companies were, or are, founded? Well, my name is Judy and I’ve been associated with Dental Ventures of America, Inc., since its inception, and I thought it might be interesting to know why, when & how it began for “DVA”. Thus, the initiation of this series of short reports, which we hope will prove interesting, maybe not exciting, but interesting, reading. e; but also offered an opportunity. Thus, was the concept for the founding of Dental Ventures of America, Inc., with its introduction of ZAPIT, a product that clearly established the “proof of concept” for the founder’s original vision. The path from the Founder’s initial dental experience as a United States Navy Dental Technician, to the establishment of a dental company offers some support for the ultimate direction one’s life can be impacted by random experiences. We’ve all experienced the results of such ‘happenstance,’ and the development of DVA’s history was certainly a result of such a chain of events. as Judy Cardellicchio at the time, but it is now Judy Honstein. Aha, now we begin to see how I have been “involved” with Dental Ventures of America from the very beginning. Please join us as I try to share the path from “random events,” opportunities, experiences, failures, successes and some interesting history of the introduction of many new products that have served to change the face of dental laboratory products and procedures. Acryl-Marvel in the Operatory? Yes, Now it’s Possible! Our Acryl-Marvel has been incredible in the lab, cutting polishing time of your restorations way down. Some practitioners and lab techs are surprised to get so much from a dental lab product. Now, you don’t have to go back and forth between pumicing and final polishing. Acryl-Marvel will give your acrylic restorations a beautiful shine in one step. But until recently, there were multiple cross-contamination procedures that had to be followed to use this product in the operatory. And it might be necessary for the dentist to move back and forth between the dental lab and the operatory to get the final adjustments made and a final smoothing and polishing done. That all ended when we created the Acryl-Marvel Adjustment Kit. If you could just smooth and polish a final adjustment of a restoration chairside and NOT have to go through elaborate (and required by law) cross-contamination prevention steps, that would save motion and save time, both for the dentist and the patient who is sitting there waiting. Now there are Acyrl-Marvel individual case ingots for your use. Trim the denture with carbide or other cutting instrument and get it just right. Then you don’t have to use pumice to make the initial smoothing of the cut surfaces. Just apply Acryl-Marvel to the wooly you get with the kit, and polish the denture. No wet work needed, no pumicing, no moving to the lab. You can get the same effect by going to the lab, but why would you want to? I can provide these ingots – and others, like the Ceramo-Dotz for ceramics, lithium disilicate and other materials – in small plastic bags, ready for labs to send out with the finished work. When the customer gets the package, there’s the final polishing compound and a polishing wooly. All the customer has to do is make final adjustments, use the Acryl-Marvel and polishing wooly to smooth the trimmed edges and provide a final shine and they are done. They don’t have to think about stocking materials for the work done in the operatory. When the lab includes a thank-you message with the delivery, this little gift acts as a powerful promotional message to customers. By the Way, Any Problems with Acrylics? I’ve been reading about people’s problems with acrylic pours. There’s shrinkage, there’s changes of colors between the time the material is cast and when it is cured. If you are having these problems, then you should look at another of our dental lab supplies, DVA Perfect Pour. As usual, our understanding of these materials has enabled us to manufacture a superior product that eliminates time in manufacture. If you are having to remanufacture acrylic products – ever! – then you should try our Perfect Pour. I think you will find that it makes your job so much easier. And then, of course, when the restoration has been created, you have our Acryl-Marvel to do the perfect finishing with! We don’t really see a difference between our friends and our customers. We so appreciate the dentists, dental lab owners and dental techs who use our products. We have something special in common with them – we both know a good product when we see it. When they call us and tell us they have recognized the time and money savings they can achieve by using our products, well, I guess you could say it creates a bond. We work hard to offer just that kind of product so part of our reward comes when someone notices. Like the call we have on our website from David Andrews about Waxie Paste. He didn’t think it was going to work when he first saw it. But he knows our product line and knows what we have been able to achieve for him up to this time. So he set his doubts aside for a moment. He found that Waxie Paste gave him a great way to mark an implant case with a cantilever pontic. The indicating paper he had been using would get marks all over the place and as a result, there would be too much grinding away of material, which would leave a space underneath it. With the Waxie Paste, he got an accurate record of the interference. When the Waxie Paste was brushed on, it went on evenly and he got an excellent indication of the exact adjustments that were needed. It didn’t take up any room to speak of so it was easy to get an accurate measurement. He said it was so much easier to use than similar products from our competitors and washed off easily. In a way, he did us a big favor with regard to our Zircon-Brite. He had a polishing compound he liked to use, but when he ran out of it, he couldn’t find where to get more. He began to buy and try one polish after another to find something comparable to the compound he ran out of. “I was on a mission,” he said. He ordered some from every manufacturer he could find. Some worked okay and some hardly worked at all. In the end, he had gone through fourteen different products. When he found Zircon-Brite, it was just what he was looking for so he could quit. It turned out that it was far more affordable than most of these other products. It’s not too surprising that he called me up to tell me that he loves these products. If you’re already using our products, help us reach more people. Tell other technicians or dentists about our products and help them save time and money like you’re able to do. It may be hard to see the profit in sharing like this but it might just win you more friends in the long run. We know how valuable those friends are. What Makes Our Waxes Different? What Makes Our Waxes Different from Other Dental Lab Supplies? There’s plenty of waxes on the dental lap supply market. Just like we do with all our other products, we try to give you not only the best product on the market, we try to think outside the box when we engineer our products. Our idea of product development is to give you something a little different, a little more advanced (sometimes a LOT more). Not just another version of the same old wax or polishing compound. This is the way we approached our formula for Dip N’ Cast waxes. We offer you four colors of Dip N’ Cast waxes in two consistencies. You can choose a firm consistency or a flexible consistency. There are two colors of each, allowing you to distinguish margins clearly. As the name implies, it can be used to coat the surface of a die. Our waxes enable you to count on less shrinkage so that you don’t have to reseal die margins. You can remove the wax pattern and then replace and reseat it without then needing to seal the margins again. On every job you do with Dip N’ Cast, you will see a consistent thickness to each dip. You’ll know what to expect each time which makes your job faster and you don’t need to make so many adjustments. Have you Seen our Hotstikz? We are very proud of our HotStikz product. If you look at other sticky wax products, they’ve got you using burners and open flames to melt the wax for adhesion purposes. We took the model of a glue gun and adapted it to sticky wax. You have greater safety without the open flame and greater precision with our heating element in our gun-like applicator keeping the wax at a consistent temperature. This means you know what the wax is going to do every time. It’s not going to be hotter one time and then less hot (and therefore thicker) the next time like it would be if it was just being melted in a flame. When other sticky wax is heated, it gets all runny which decreases your control of where it goes and how much of the wax gets applied. Hotstikz will give you a consistent amount of wax in a consistent pattern. Like so many of our products, this is going to save you time. It will cleanly peel away from the work surface, too. These two qualities mean that you are going to save time on the production line. Your dies will be stabler, and then when the wax is removed, they will be cleaner. You can expect this wax to have a short cooling cycle, another time-saving feature. These are not all the waxes we manufacture for you but these are all I have time for today. Next time, we’ll talk about Wonder Wax and some of the other products we make to use when you’re working with our waxes. If you have been working in dentistry for a while, then you have seen this industry change dramatically. I’m glad for all these changes. These new technologies provide excellent products with amazingly fast turnarounds. For example, we have a lot of customers who are using the Sirona Dental System. It’s that end of our technology where the most changes are happening. With this in mind, I was looking at the Dental Compare blog today. I enjoy the scope of their reporting. In a December 2013 post, they reported on the top ten products of the year. There’s a few scanners for digital impressions, a camera, a couple of lasers and a hybrid ceramic block for use in CAD/CAM. This new block from VITA ENAMIC incorporates the best qualities from both ceramics and polymers so that the finished restoration offers great results for your patients. There’s not that many industries that play such a critical role in patients’ lives. Of course, medicine does, but patients rely on these onlays, crowns, bridges and dentures for the remainder of their lives. If these products fail, there’s discomfort and expense as well and the potential for more serious problems to develop. So the developments that let us offer faster service, great appearance and the durability patients want are all moves in the right direction. As technologies change, we have to keep up. If we only provided polishing agents for ceramic or metals, we would miss the chance to help our customers who are working with these hybrid materials. So that’s why I work hard to monitor the changes in the industry. When the next generation of materials comes out, I want to be able to provide the dental lab supplies you need to excel. On the Dental Compare site, there is an article about these new technologies. This article makes the point that some people think this new technology fails to offer as good a result as more traditional dental lab technology. I agree with his conclusion: In the hands of well-trained people, the results are every bit as accurate, pleasing to the patient and durable. It was the advancement of our industry that led us to develop Hy-Brite, our polishing product for these hybrid materials we were talking about. If you try to fire this material, the composite part of the combination will be destroyed. But this material is perfectly suited to the CAD/CAM systems. Hy-Brite is the perfect polishing product for use with these materials. It comes with its own special soft-bristle brush. Just like many of our other polishing products, it will turn a milled restoration into a polished, beautifully finished product in seconds. We’re going to continue to monitor the industry so we can provide you with the dental lab supplies and equipment you need to keep your operation profitable. If you’re working on something new that might require new dental products for finishing, polishing or operatory use, let us know. I know I usually talk about our dental lab supplies related to polishing and sometimes waxes and such, but the fact is that our model system is widely accepted. If you have not heard about our precision system, then I guess it’s time I should talk about it. The major advantage of our system is its accuracy. But that is, of course, a huge consideration. Your patients may be living with your restoration for the remainder of their lives. We have developed a remarkably stable, accurate system for models. It took thinking through the problems with model-making from the very bottom to the top. Many people talk about problems in accuracy stemming from linear distortion coming from the setting expansion of stone. Our system provides improvement of final linear cross-arch expansion. It’s been used for more than twenty years – that’s plenty of time to work out any bugs! The key to the accuracy of our system is a stable foundation that eliminates the moving or shifting of dowel pin locations. You just have to pre-determine the location of these pins relative to the impression before you pour the die. Multiple studies have noted that a stable base eliminates this distortion. Our system uses this datum as the foundation of our process. With our system, you don’t have to glue your pins into the dies. You start by relating the pre-manufactured base to the impression. You then drill precise pinholes in each location and then drop the pins into the holes. You used to have to pre-mark the location of each pin but now we have a new Alignment Fixture that eliminates this requirement. I’ll talk about that another time. No glue is needed as the pinholes are tapered. Friction will do the work. That will save you time and money. When you drop the pins into place, you don’t have to use a lot of pressure. That would tend to lock things together and you will need to remove and replace some of these pins. Now, your model is stable. You can saw your arch into the segmented parts you need and the pins mean that your base is completely stable. There will be no expansion or distortion. The pins will return to their original locations with respect to the dies. This system will save you so much production time and make the fits of the final restorations extremely accurate. That, of course, makes your patients very happy. And it means that you won’t have to do this work twice. We’ve got a video on our website that will show you the whole process. You can see it by visiting https://www.dentalventures.com/precision-model-system/#demo. Let me know if we can answer any questions for you.